On Inside The Formation we'll look at an individual player's performance and analyse their input into the game. Today Joss Bennett looks at Tomas Rosicky's performance against Spurs. After scoring his first goal in over two years for the club, I felt it only appropriate to discuss Tomas Rosicky’s majestic performance against that side we’re ever so fond of. Yes, that one. The goal – arguably the most important of the match as Arsenal really showed they meant business – was one of superb quality. Drive, vision and skill were all involved as the Czech midfielder completed the come-back by starting and finishing a fluid break away move. Rosicky’s brilliant display was also shown in the statistics, with the midfielder an integral part of Arsenal’s pressing game that forced Spurs back into their own half and limited their potential to counter-attack and dictate the game. Rosicky made the joint-second most tackles (four) during the game, although he also committed two fouls*. The former Dortmund player, who hadn’t scored since his injury-time equaliser against Everton in January 2010, could have scored earlier than he did after he flicked a header from a corner towards the far corner – only to be denied by a brilliant save from Brad Friedel. Playing slightly ahead of Mikel Arteta and Alex Song, Rosicky had the difficult task of evading the challenges of Scott Parker. 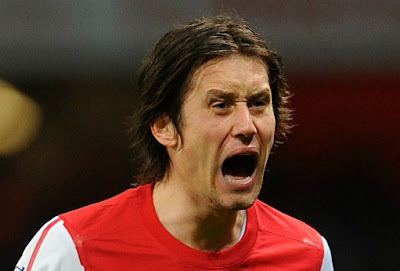 Rosicky’s performance level was emphasised by the fact that – despite being dispossessed three times and turning over the ball a further two times, he still managed to achieve the third highest rating from Whoscored.com (8.5), less only than double-goalscorer Theo Walcott and Robin van Persie*. As I have explained previously in more detail, Rosicky and Ramsey present two different options for Arsene Wenger in his quest to replace Cesc Fabregas. Although it is clear that neither are at his level – at least not yet – it is promising that we finally have more than one promising player in a crucial role on the pitch. Rosicky’s goal showed the best of what the Czech international can offer The Gunners, displaying his ability to drive from midfield and desire to get into the box and score goals. When he first joined Arsenal, he made an immediate impact, with 12 goals in his first two seasons before injury worries kept him out of the game altogether. Having been plagued by persistent injuries during his time at Arsenal, it was especially pleasing to see Rosicky with the confidence and desire to put the ball in the back of the net once more. Rosicky has also shown increased confidence when taking on players - completing two dribble attempts and averaging 0.9 dribble attempts per game so far this season*. In the attacking third, Rosicky is arguably less creative than his main competitor for the ‘Cesc role’ –attempting (and completing) only one through ball and creating just one goal-scoring opportunity for a team-mate. However, while he may be accused of ball-hogging, it comes as a relief for Arsenal fans that someone is finally willing to take a shot rather than look for the more complicated pass, with Rosicky taking four shots overall during the game*. Of course it’s still far too early to say that Rosicky is back to his ‘best’ (if we’ve ever truly seen that while he’s been at the club), but recent performances suggest he is well on his way to getting somewhere near that standard. If Tomas Rosicky and Aaron Ramsey can stay fit for the rest of the season, then Arsene Wenger may well be considering the value of dipping into the transfer-market. Two very different players, who both have the ability to pose a real threat to almost any team when they’re on top form – Arsene Wenger’s refusal to invest in a ‘proper’ replacement may well begin to be vindicated come the end of the season.